If you are anything like me, the cabin fever has really been driving you bonkers for a couple months now. For me though, April is probably my favorite month of the whole year! April is the month that I start exploring my local waters again, looking for trout, pike, stripers and more. These next few weeks are also when I take one last look over all my gear to ensure everything is in good working order for the coming season. While the saltwater fishing might take a few more weeks to heat up, take every chance you can get to explore your freshwater spots. The CT DEEP is working their way around the state with trout stocking trucks, providing a much-needed tug on the line for many of us. 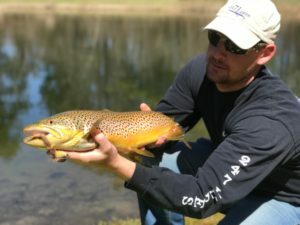 Before the trout season opener, I’m usually checking out some of the trout management areas generally open to year-round fishing. Specified sections of the Hammonasset River, Merrick Brook, Quinnipiac River, and Salmon River are just a few of the early season chances to wet a line and start shaking that fever (please check current DEEP regulations). Personally, I really enjoy taking quick afternoon trips to my local trout stream during the first half of April. When the sun is highest in the sky and the water is warmest, it only takes an hour or two of fishing for me to shake some of winter from my bones. Fly fishing for trout is also an excellent way to test a fisherman’s skill (and patience) for the coming season. While most fly fishermen are tying on a size 16-18 Stonefly or other bead head nymph during the early season, I tend to take a different approach. A large streamer pattern, like the sculpin pattern local legend Rich Strolis calls his “Headbanger” is a big personal favorite. While fishermen near me might be catching higher quantities of small trout on their little nymphs, bringing a large carnivorous brown trout to hand always impresses the onlookers. Depending on the weather patterns, April will also be the month that I start exploring larger bodies of water looking for those bigger predators like Northern Pike. Plenty of lakes and ponds in Connecticut have populations of Pike and Pickeral, as well as most river systems. Pike will be feeding heavily just before and just after their spawn, and now is prime time to catch one of the trophies! Look for underwater points, channel edges, and drop-offs where Pike get funneled as they travel. Right around ice-out, Pike will start moving back into smaller water to spawn and while they’re on the move you should be able to intercept them better than once they get into their spawning grounds. Just after the spawn is also a good time to target hungry pike. Look for those same bottleneck spots as pike move from shallow water spawning grounds into the bigger water summer hangouts. The mouths of creeks and coves along a bigger river is where I spend my spring time looking for pike. Big swimbaits and stout rods are a necessity during this spring pike opportunity, you never know how big that next pike might be! As April progresses, I’ll work my way further downstream to more tidal influenced areas. The second half of April can be an absolutely magical time if/when all the stars align. And by magical, of course you should know I’m talking about that first striped bass of the season. Many different factors play a role in the yearly return of the stripers – rainfall, snowmelt, water temperature, baitfish migration, and more. During the second half of April and into May I’ll be checking out tidal rivers in search of that first push of early season migratory bass. Yes, there are certain rivers anglers can catch dozens of “holdover” stripers all winter long, but because of the fishing pressure that they face, I have personally been avoiding those specific bodies of water. That said, any tidal river could hold some population of holdover bass, you just have to get out there and look for them. Where I spend most of my time in late April will be all those other tidal rivers and bays. The lower sections of the Connecticut River, Thames River, and Mystic River all have excellent early season striper spots. Until I find those early spring bass for myself, or get some good intel from a friend, I’ll often hop from spot to spot looking to see what I can find. During this early season search for stripers, I’m typically using lighter gear than I would throughout the rest of the season. Some of these tidal rivers I’ll be fishing aren’t much bigger than a medium-sized trout stream. Usually a 7’ rod and a 3500 reel will be in my car and ready to go for several weeks of April and May. When it comes to choosing lures for early season stripers, I’ve been a big fan of the Sad Shad from Cobra Bait. Owner Jon makes them right here in central Connecticut, and guys have been catching stripers on them for years. While the larger 9” versions work great during the warmer months, I’m typically carrying a small selection of the 5” and 7” versions for my early spring trips. Often overlooked during these first few months of fishing is the still very cold water temperatures. Please remember that even during an abnormally warm spring day, water temperatures are still drastically lower than you might expect. Be sure to wear proper cold water gear just in case you end up taking an unexpected swim.